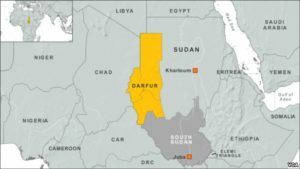 The Sudanese regime has disputed a report that it used chemical weapons in the Darfur region. Sudan’s U.N. ambassador said the Amnesty report was “utterly unfounded” and that Sudan does not possess any type of chemical weapons. As many as 250 people, including children, may have died as a result of chemical attacks, and hundreds more have been injured, according to the rights group. The U.N. estimates that more than 300,000 people in Darfur have died since 2003. Sudanese Minister of Justice Awad Hassan Elnour said officials were “very astonished” to hear the report, which he said the Khartoum government refutes. Elnour said many of the people cited in Amnesty’s report came from central Darfur villages such as Golo, Rokro and Nertiti, who said they had left their villages to avoid the military violence and none had reported symptoms like those described by Amnesty. Fighting has never entirely stopped in Darfur since 2003, when rebels launched a rebellion, citing discrimination and marginalization.